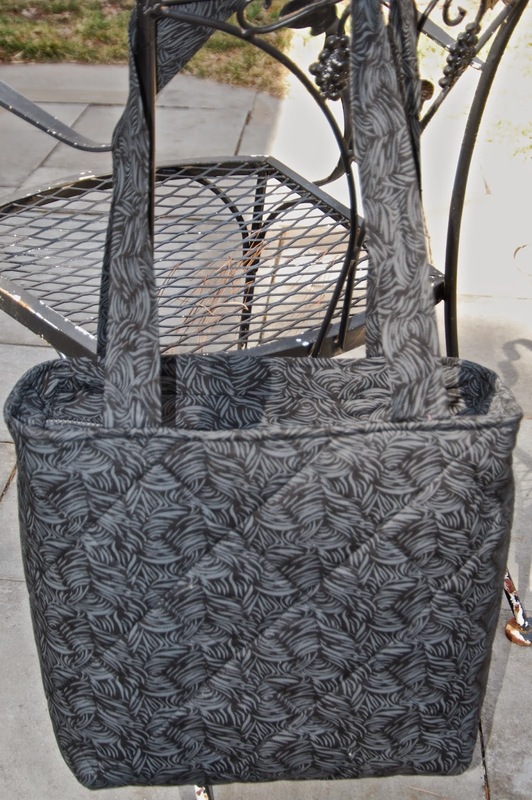 The Restitcherator: Custom Tote Bag - Pattern Adapted from "Easy to Make Totes with Zippers"
Custom Tote Bag - Pattern Adapted from "Easy to Make Totes with Zippers"
My cousin asked me to make her a bag last year. Yes, last year. I knew exactly the pattern I'd use, she got the fabric right away, and here it is April and I've just finished it. She needed a tote bag for work, that would carry "a lot of stuff". She showed me the bag she was using and I knew I could give her a huge improvement. 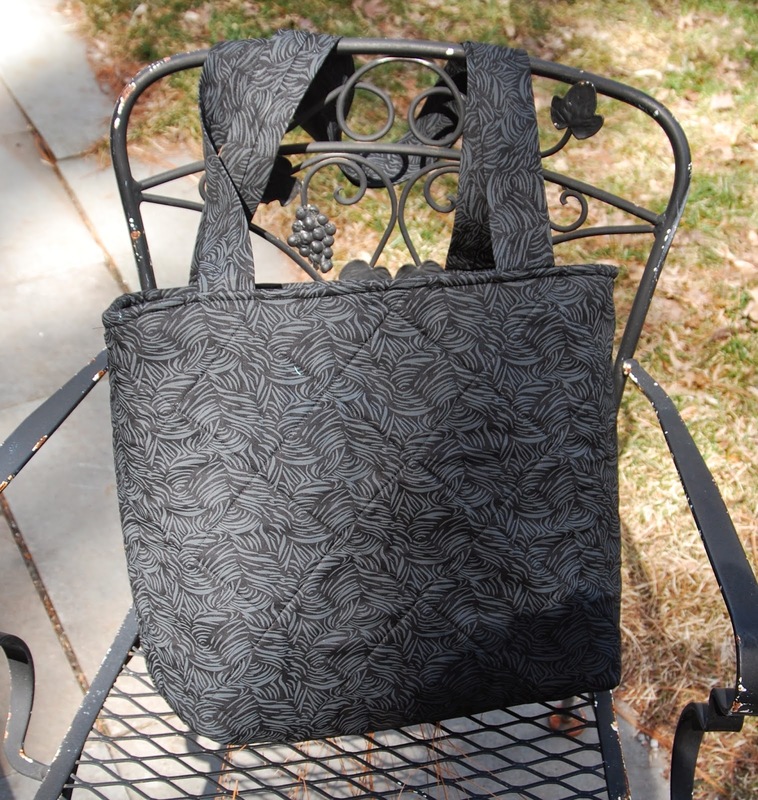 She chose black fabric with a wavy grey pattern. Good choice for work, should wear well and not show too much dirt. I had made a similar bag from this book once before. It's a fantastic book, Easy to Make Totes with Zippers by Cindy Taylor Oates, from 2003 I think. The directions are clear and just detailed enough with drawings for anything that's hard to describe. I'm 99% sure I got the book on Ebay super cheap. The pattern I adapted was the one on the lower right, that shows multi-colored stripes and webbing straps. Yikes. So I took the final measurements I needed and just made a single piece and quilted it in diamonds. And I made her 2" wide straps so that they wouldn't dig into her shoulder. The striped one at the bottom is the pattern I used. My favorite part of this pattern is the recessed zipper. It's actually really easy to put in if you measure everything carefully. When you put the placket onto the bag, there's about 10 layers to sew through, so I did break a few needles, and had to turn the wheel by hand, but that's a common occurrence with me and making bags...either I'm too rough, or the machine is too cranky...or both. I'm so happy with the result and my cousin will most definitely be more comfortable (and chic!) carrying her work in this.